Observations indicate that since the 1970s Equatorial Atlantic sea surface temperature (SST) variations in boreal summer tend to modulate El Niño in the following seasons, indicating that the Atlantic Ocean can have importance for predicting the El Niño–Southern Oscillation (ENSO). The cause of the change in the recent decades remains unknown. Here we show that in the Bergen Climate Model (BCM), a freshwater forced weakening of the Atlantic meridional overturning circulation (AMOC) results in a strengthening of the relation between the Atlantic and the Pacific similar to that observed since the 1970s. During the weakening AMOC phase, SST and precipitation increase in the central Equatorial Atlantic, while the mean state of the Pacific does not change significantly. In the Equatorial Atlantic the SST variability has also increased, with a peak in variability in boreal summer. In addition, the characteristic timescales of ENSO variability is shifted towards higher frequencies. The BCM version used here is flux-adjusted, and hence Atlantic variability is realistic in contrast to in many other models. These results indicate that in the BCM a weakening AMOC can change the mean background state of the Tropical Atlantic surface conditions, enhancing Equatorial Atlantic variability, and resulting in a stronger relationship between the Tropical Atlantic and Pacific Oceans. This in turn alters the variability in the Pacific. 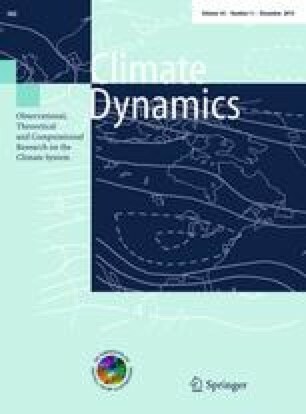 This paper is a contribution to the special collection on tropical Atlantic variability and coupled model climate biases that have been the focus of the recently completed Tropical Atlantic Climate Experiment (TACE), an international CLIVAR program (http://www.clivar.org/organization/atlantic/tace). This special collection is coordinated by William Johns, Peter Brandt, and Ping Chang, representatives of the TACE Observations and TACE Modeling and Synthesis working groups. We thank Tarjei Breiteig, Helge Drange, Stefan Sobolowski, Tore Furevik and Jin-Yi Yu for valuable discussions and input, and Ingo Bethke for providing support with BCM data. We also thank two anonymous reviewers for constructive suggestions and comments. This study has been supported by the Research Council of Norway through the IndiaClim project, as well as by the EU FP7 SUMO (No. 266722) and STEPS (PCIG10-GA-2011-304243) projects.